Lots NEW! Our Roald Dahl printables - specifically our posters of favourite Roald Dahl characters - are useful for both classroom and library displays. We also have a golden ticket "doodle" to which the kids can add their own details, and more doodle pages perfect for a Roald Dahl theme. Augustus Gloop must have been very excited to visit the factory in the story Charlie and the Chocolate Factory by Roald Dahl. Do you know what happens to him? Lets just say he meets a sticky end! If you were to meet a Big Friendly Giant, I wonder if he would look like this? This poster is our interpretation of the BFG from Roald Dahl's wonderful book, ready for you to print and display. Here's a poster to print of our version of an excited Charlie Bucket, complete with his hard-won golden ticket! Here's a fun drawing activity for children to enjoy when the read Roald Dahl's The Twits. 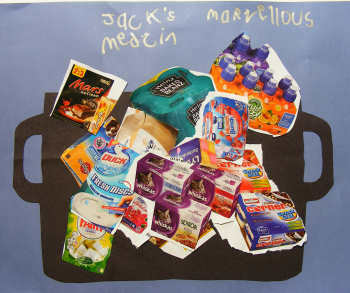 Your children can be just like George and design their own 'marvellous medicine' with our worksheet. They will need to think about the ingredients they will use and what their medicine will do. If you are reading George's Marvellous Medicine (or George's Marvelous Medicine, if you are based in the US!) you might enjoy our poster to print and display. It certainly looks like George is making a really interesting concoction, doesn't it? Here's a fun poster to print of our interpretation of James and the Giant Peach, from the well-known Roald Dahl story. Matilda is my favourite Roald Dahl character - and I suspect she might be yours, too! Here she is with her favourite books, as a poster to print and display. Everyone loves Miss Honey, Matilda's lovely, kind teacher in the Roald Dahl's book called Matilda. Here's a poster of our version of Miss Honey to print and display. All the children and teachers are scared of Miss Trunchbull - and with good reason! You really wouldn't want to go to a school where she was headmistress, would you? Here's a fun poster to print. This is Mr Twit from the story The Twits by Roald Dahl. Can you see his nasty wife has put her glass eye in his drink? They are always playing tricks on each other! Here's a poster of Mrs Twit looking very nasty. Did you know she gave her husband worms for tea? Roald Dahl certainly had a rich imagination when he wrote The Twits. Veruca Salt really was a bad nut! Here she is about to go down the rubbish shute! She comes from one of Roald Dahl's best loved books, Charlie and the Chocolate Factory. Violet Beauregarde comes from the story Charlie and the Chocolate Factory by Roald Dahl. She doesn't behave well when she visits the chocolate factory and turns into a blueberry! Charlie and the Chocolate Factory is a wonderful story by Roald Dahl. We've created this picture of Willy Wonka for you. Print him out as a poster, or cut him out and draw his chocolate factory in the background!